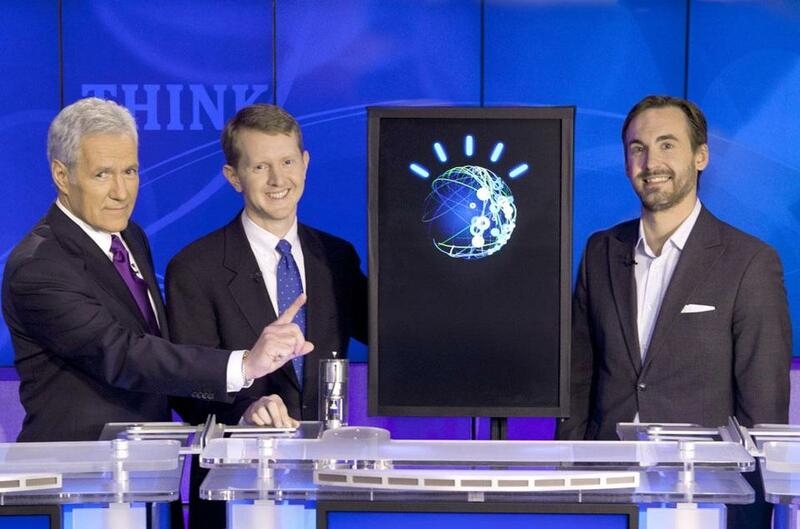 After IBM’s Watson computer beat “Jeopardy’’ contestants, Nuance said it would partner with IBM. In the latest batch of television ads for Apple’s iPhone 4s, one high-profile Massachusetts resident takes center stage. But a second, perhaps more crucial local player, remains incognito. Movie star John Malkovich, who lives in Cambridge, lounges in a leather chair and chats with Siri, the virtual personal assistant built into Apple’s latest mobile phone. “Life . . .,” Malkovich says languidly. “Try and be nice to people,” Siri replies. “Avoid eating fat.” The software that translates Malkovich’s words into text so that Siri can serve up an answer is made by Nuance Communications, a Burlington company that goes uncredited in the ads, on Apple’s website, or in any of the company’s public statements. The Apple campaign, unavoidable on the airwaves these days, is the highest-profile moment that the rather nerdy field of speech recognition has ever had. Yet the company that has grown into the dominant player over the past decade — mainly through a series of smart acquisitions — doesn’t get a chance to bask in the glory. Nuance is in the same position as many other successful Massachusetts tech companies: Most of its revenue — $1.4 billion in 2011 — comes from selling its products to other businesses, and yet it yearns to have a more direct relationship with consumers. When I spoke with Mahoney last week, the challenge facing Nuance was much the same as it was when we talked in 2008: “creating a recognizable, valuable consumer brand,” in his words. You can’t fault Nuance chief executive Paul Ricci for his vision: In 2001, when Nuance was known as ScanSoft, he paid $40 million in a bankruptcy auction to acquire the assets of Lernout & Hauspie, a Belgian company that had bought up many pioneers of speech recognition. A parade of other purchases followed, including many of local companies such as SpeechWorks International, Voice Signal Technologies, and, last December, Vlingo. Recently, Nuance has demonstrated new technology called Dragon Drive that can be built into cars, allowing drivers to play certain songs or initiate calls by speaking. Samsung’s latest high-end “smart TVs” include voice recognition software from Nuance that allows viewers to turn them on, change channels, and even initiate Skype videoconferences by speaking. And the free Dragon Go app, available for iPhones and Android phones, gives you 80 percent of Siri’s features, without having to buy Apple’s latest phone. Ask it to play Count Basie, find the closest Panera, or tell you when “The Avengers” movie is playing and it obliges. (Unlike Siri, it can only search the Web — not the calendar or contact information that’s stored on your phone.) In other words, Nuance is staking out a spot in your pocket, your vehicle, and your living room. A next step for the company, Mahoney says, is software that doesn’t just respond to spoken instructions, but understands emotion and context. If you sound stressed because you’re late for a meeting and stuck in traffic, for instance, it might suggest an alternate route or offer to send a text message to let colleagues know you’re running late. But as Nuance buys up smaller speech companies and tries to develop more products to deliver directly to consumers, it finds itself competing with two enormous companies that already have relationships with millions of us: Google and Microsoft. Both have been making major investments in speech recognition. But one of the things Nuance has sought in buying up so many of its rivals is pricing power — the ability to command a high price for its products and services when it negotiates with customers. Now, the company is facing off against two heavyweights with innovation in their DNA, and the ability to undercut Nuance on price. That means Nuance will have to devise new tactics to stay on the leading edge of the speech industry. On that matter Siri may not be much help.